Tomorrow (5pm eastern) in Los Angeles Disney (DIS) will hold an analyst day to discuss their plans for the integration of the recently acquired 21st Century Fox content assets and their plans to launch Disney + over the top (OTT) streaming service by year-end. A pair of analysts see Disney stock breaking out of its price range in the coming year. Cowen’s Doug Creutz raised his rating on the stock to Outperform, from Market Perform, on Tuesday and lifted his price target to $131, from $102 previously. Creutz cited several positive near-term catalysts for the shares, including a stacked 2019 film slate (including Frozen 2 and Star Wars Episode IX) and the coming opening of a Star Wars-themed world at Disney’s U.S. theme parks. He also expects Disney+ to have a strong launch and sign up more initial subscribers than the market is forecasting. Citing the upfront costs required to build out Disney’s streaming technology, produce content for its services, and market them to consumers, Nathanson lowered his earnings estimates for Disney’s current and next fiscal years. But he also sees investor sentiment becoming more positive and forecasts the stock rising to a valuation multiple above the market average. Nathanson’s $134 target is 20 times his fiscal 2020 EPS estimate of $6.70. This year he expects Disney to earn $6.30 per share, and $7.50 in 2021. He estimates that Disney+ will have over 15 million subscribers in 2021, growing to 35.5 million in 2023. Nathanson is widely considered to be one of the best media analysts, and I suspect for the time being a path towards his subscriber estimates for Disney+ will be one of the main drivers of the stock’s performance going forward. 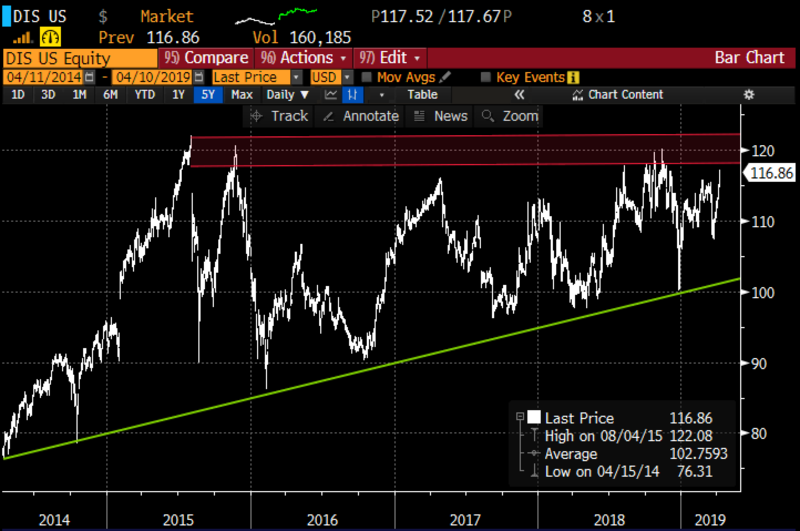 Backing the chart out to its prior all-time highs it becomes apparent that the resistance range is above what has been a very long consolidation since 2015 when the company made it abundantly clear that cord cutting from traditional cable services was a trend that was not likely to reverse anytime soon and that the company would be forced to invest heavily in original content and ott to compete with the likes of Netflix, Hulu and eventually Amazon and Apple. So what to expect tomorrow? it sounds like they will NOT be providing financial or subscriber guidance for the service that has yet to launch, and rather focus on the offering and the properties. But the company is scheduled to report fiscal Q2 results on May 8th after the close, and this could be the real event for bulls looking to play for a breakout, largely because the stock has already ripped into this well-telegraphed event. So what’s the trade? If i were inclined to play for a breakout to new all-time highs in the coming months, I might look to fade short-dated options in the form of out of the money calls and use the proceeds to buy longer-dated calls. 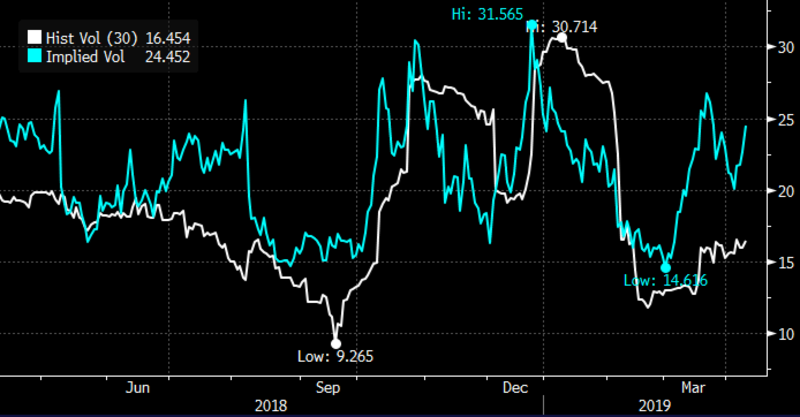 The spread between 30-day at the money implied volatility (the price of options, blue line below) and 30-day at the money realized volatility (how much the stock is moving, the white line below) is at its widest in nearly a year, making short-dated options look expensive. 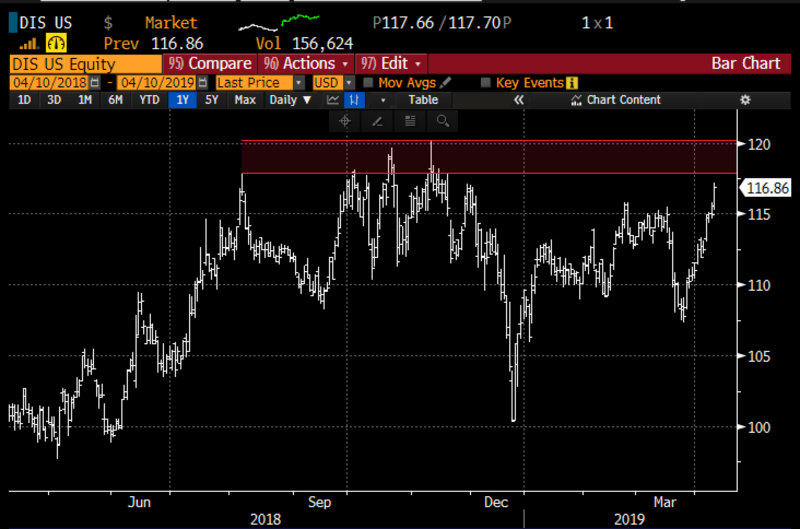 Profits capped at 125, but the May 125 call has only about a 20% probability of being in the money, with the strong likelihood that the stock is below $125 and the short call expires worthless or can be covered for pennies after their May 8th earnings. The best case scenario on May expiration is that the stock rises above the long 120 Sept strike but below the short 125 May strike and the short strike can then be rolled either again in a diagonal, maybe in June or July expiration, or turned into a vertical call spread by selling a higher strike call in Sept expiration. This trade idea risks 3.5% of the stock price, but has the potential for that risk to be further reduced over the course of the trade. The worst case scenario is that the stock plunges and the long Sept 120 call loses most of its value.